We are falling hard for fringe this fall! 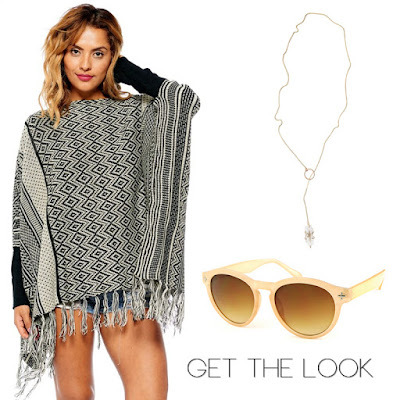 Our Layla Fringe Poncho is the perfect sweater/poncho to add to your wardrobe this fall. The built in sleeves make this gem no ordinary poncho. The black and cream combo makes it easy to wear with items that are already in your closet. Add a long necklace like our Tavi Lariat Necklace by California based jewelry company, Five and Two and Maya Bay Sunglasses to complete the look. Get the look aboard the pink mobile boutique at an upcoming stop or online through the links below.